Lock in a great price for Hotel De L'Europe – rated 8.1 by recent guests! The view from the rooms (especially 207 and 208) facing the water are very nice,. 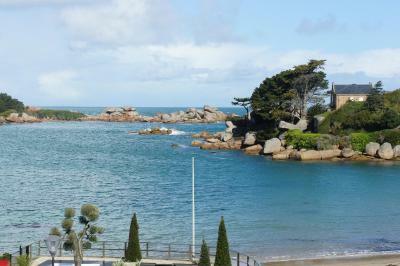 Fabulous location steps from the Rose Granite Coast. Receptions was welcome, knowledgeable and multilingual. Room was quiet. Wonderful beach-side restaurant almost next door. Good value. Friendly staff and good location, balcony overlooking beach, comfy bed. The location is excellent, we had a sea view room. 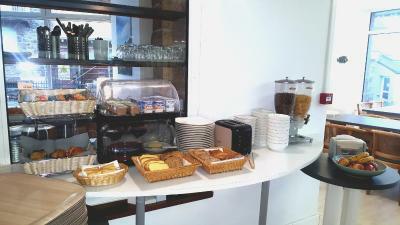 The breakfast was reasonably priced and very good, continental but help yourself, so plenty to be had! 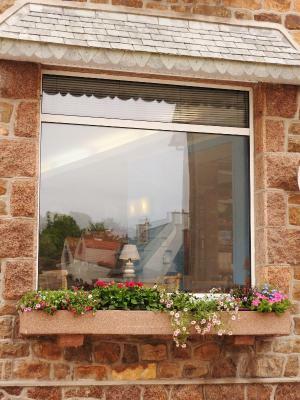 Right by the beach and easy access to the coast path to the lighthouse and the charming and mysterious Pink Granit Coast. No real problems at all, we've stayed here before, mainly because of the location, and nothing has changed, it was good before and it's still good now, friendly staff and good breakfast. Super situation. Friendly and helpful staff. Paid 20 euros extra for a sea view, well worth it. Restaurants and beach close by, quiet location this time of year but can imagine it's very busy in the summer. Beds comfortable and towels changed everyday . Our room overlooked the small car park attached to the hotel so a quiet room except for when guests were departing in the morning. The location (especially for the rooms with a sea view) is wonderful. Straight out of M. Hulot's Holidays, the charming village is kept French and civilised by what looks like strict enforcement by the council. At 7 PM the shops and terraces close down and the public is moved inside. The hotel's location is smack in the middle of the action with even a few parking places available for guests (won't suffice though, so early arrival is recommended). One of our top picks in Perros-Guirec.Citotel Hotel de l’Europe is located on the Granite Rose Coast, near Saint-Guirec Beach. Its 2-star rooms are en suite with TV. Some rooms have a view of the sea. Wi-Fi internet access is available throughout the entire property and is free of charge. Citotel Hotel de l’Europe has a charming bar and serves a daily breakfast. Citotel Hotel de l'Europe is also located near the famous lighthouse of Ploumanac'h and the castle on the island of Costaeres. This room has a TV and an private bathroom with a shower. This room has a private balcony and a TV. There is also an private bathroom with a shower. Some of those rooms feature a private terrace with city view. It provides a private bathroom with bath. A TV is provided. This room features a balcony with sea view. It provides a private bathroom with shower or bath. A TV is provided. Reservation was for two nights in a superior twin room. First night, we were initially given 208, which is a tiny superior full-size bed room. After insisting we needed two beds, we were given a standard family room for the night., with no view. Second night we were given 207, which has the great view--and a very small bathroom. Breakfast was underwhelming. A little worn, v small room. A bit over priced - I think you pay for the location which is right overlooking the beach. No tea or coffee making facilities in the room and with the reception locked up and closed in the early evening no chance of getting anything from the hotel. Too early check out the day after. The only slight problem was that only after checking out did I notice that we'd been charged more than the price we clicked on to book, the total cost on the booking confirmation was €132, but with no extras at all, the total bill was over €169. The hotel is quite good, and no problems with the room, but they didn't charge us the booking price. There was no comment or explanation, so I didn't notice until after we'd left. Very small bedroom and bathroom, but still adequate for an overnight stay. Hotel only catered for breakfast but we did not partake as being Glutenfree I find I cannot eat a lot on offer, ie croissants etc. Car parking very restricted but large car park within short walking distance .